The NASA/ESA Hubble Space Telescope – with a little help from an amateur astronomer – has produced one of the best views yet of nearby spiral galaxy Messier 106. Located a little over 20 million light-years away, practically a neighbour by cosmic standards, Messier 106 is one of the brightest and nearest spiral galaxies to our own. Despite its appearance, which looks much like countless other galaxies, Messier 106 hides a number of secrets. Thanks to this image, which combines data from Hubble with observations by amateur astronomers Robert Gendler and Jay GaBany, they are revealed as never before. At its heart, as in most spiral galaxies, is a supermassive black hole, but this one is particularly active. Unlike the black hole at the centre of the Milky Way, which pulls in wisps of gas only occasionally, Messier 106’s black hole is actively gobbling up material. As the gas spirals towards the black hole, it heats up and emits powerful radiation. Part of the emission from the centre of Messier 106 is produced by a process that is somewhat similar to that in a laser - although here the process produces bright microwave radiation . As well as this microwave emission from Messier 106’s heart, the galaxy has another startling feature - instead of two spiral arms, it appears to have four. Although the second pair of arms can be seen in visible light images as ghostly wisps of gas, as in this image, they are even more prominent in observations made outside of the visible spectrum, such as those using X-ray or radio waves. The extra arms appear to be an indirect result of jets of material produced by the violent churning of matter around the black hole. As these jets travel through the galactic matter they disrupt and heat up the surrounding gas, which in turn excites the denser gas in the galactic plane and causes it to glow brightly. This denser gas closer to the centre of the galaxy is tightly-bound, and so the arms appear to be straight. However, the looser disc gas further out is blown above or below the disc in the opposite direction from the jet, so that the gas curves out of the disc — producing the arching red arms seen here. Despite carrying his name, Messier 106 was neither discovered nor catalogued by the renowned 18th century astronomer Charles Messier. Discovered by his assistant, Pierre Méchain, the galaxy was never added to the catalogue in his lifetime. 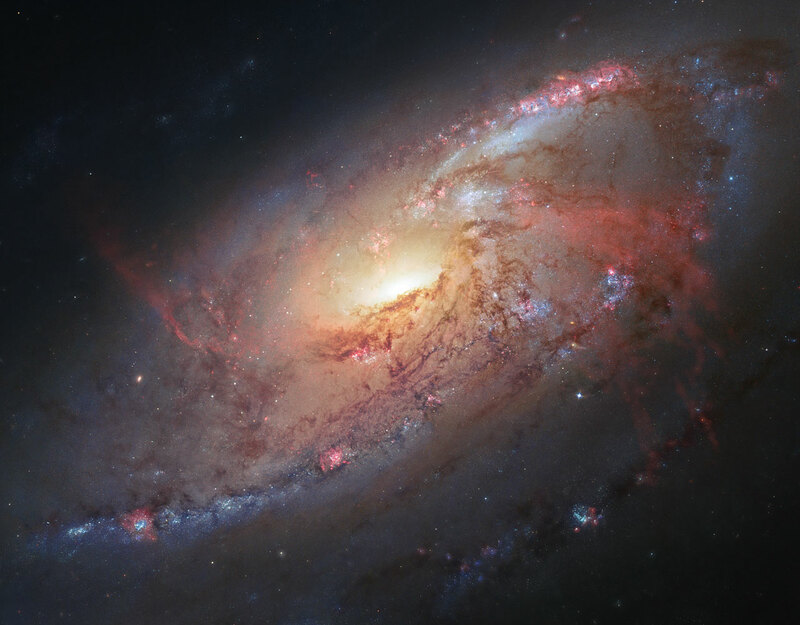 Along with six other objects discovered but not logged by the pair, Messier 106 was posthumously added to the Messier catalogue in the 20th century. Amateur astronomer Robert Gendler retrieved archival Hubble images of M 106 to assemble a mosaic of the centre of the galaxy. He then used his own and fellow astrophotographer Jay GaBany’s observations of M 106 to combine with the Hubble data in areas where there was less coverage, and finally, to fill in the holes and gaps where no Hubble data existed. The centre of the galaxy is composed almost entirely of Hubble data taken by the Advanced Camera for Surveys, Wide Field Camera 3, and Wide Field and Planetary Camera 2 detectors. The outer spiral arms are predominantly HST data colourised with ground-based data taken by Gendler’s and GaBany’s 12.5-inch and 20-inch telescopes, located at very dark remote sites in New Mexico, USA. Gendler was a prizewinner in the recent Hubble’s Hidden Treasures image processing competition. Another prizewinner, André van der Hoeven, entered a different version of Messier 106, combining Hubble and NOAO data. Lasers work when light stimulates emission of more light from a cloud of excited gas, with the original light in effect being amplified (the word laser is an acronym for light amplification by the stimulated emission of radiation). The centre of M106 harbours a similar phenomenon called a maser (short for microwave amplification by the stimulated emission of radiation), in which microwave radiation, which is at longer wavelengths than visible light, is emitted. Note that unlike man-made lasers, which are designed to produce a narrow beam, astronomical masers shine in all directions.